This article is about the general concept. For Robert A. Heinlein's series of short stories and novels, see Future History (Heinlein). A future history is a postulated history of the future and is used by authors of science fiction and other speculative fiction to construct a common background for fiction. Sometimes the author publishes a timeline of events in the history, while other times the reader can reconstruct the order of the stories from information provided therein. History is the study of the past as it is described in written documents. Events occurring before written record are considered prehistory. It is an umbrella term that relates to past events as well as the memory, discovery, collection, organization, presentation, and interpretation of information about these events. Scholars who write about history are called historians. The future is the time after the present. Its arrival is considered inevitable due to the existence of time and the laws of physics. Due to the apparent nature of reality and the unavoidability of the future, everything that currently exists and will exist can be categorized as either permanent, meaning that it will exist forever, or temporary, meaning that it will end. In the Occidental view, which uses a linear conception of time, the future is the portion of the projected time line that is anticipated to occur. In special relativity, the future is considered absolute future, or the future light cone. Neil Ronald Jones was an American author who worked for the state of New York. Not prolific, and little remembered today, Jones was ground-breaking in science fiction. His first story, "The Death's Head Meteor", was published in Air Wonder Stories in 1930, possibly recording the first use of "astronaut" in fiction. He also pioneered cyborg and robotic characters, and is credited with inspiring the modern idea of cryonics. Most of his stories fit into a "future history" like that of Robert A. Heinlein or Cordwainer Smith, well before either of them used this convention in their fiction. Lois McMaster Bujold is an American speculative fiction writer. She is one of the most acclaimed writers in her field, having won the Hugo Award for best novel four times, matching Robert A. Heinlein's record, not counting his Retro Hugos. Her novella "The Mountains of Mourning" won both the Hugo Award and Nebula Award. In the fantasy genre, The Curse of Chalion won the Mythopoeic Award for Adult Literature and was nominated for the 2002 World Fantasy Award for best novel, and both her fourth Hugo Award and second Nebula Award were for Paladin of Souls. In 2011 she was awarded the Skylark Award. In 2013 she was awarded the Forry Award. She has won two Hugo Awards for Best Series, in 2017 for the Vorkosigan Saga and in 2018 for the World of the Five Gods Series. The Vorkosigan Saga is a series of science fiction novels and short stories set in a common fictional universe by American author Lois McMaster Bujold. The first of these was published in 1986 and the most recent in May 2018. Works in the series have received numerous awards and nominations, including five Hugo award wins including one for Best Series. George Raymond Richard Martin, also known as GRRM, is an American novelist and short story writer in the fantasy, horror, and science fiction genres, screenwriter, and television producer. 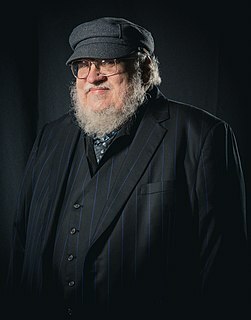 He is best known for his series of epic fantasy novels, A Song of Ice and Fire, which was adapted into the HBO series Game of Thrones (2011–2019). Earlier, some works were published which constituted "future history" in a more literal sense—i.e., stories or whole books purporting to be excerpts of a history book from the future and which are written in the form of a history book—i.e., having no personal protagonists but rather describing the development of nations and societies over decades and centuries. 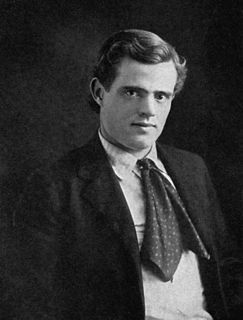 Jack London's The Unparalleled Invasion (1914) describing a devastating war between an alliance of Western nations and China in 1975, ending with a complete genocide of the Chinese. It is described in a short footnote as "Excerpt from Walt Mervin's 'Certain Essays in History'". André Maurois's The War against the Moon (1928), where a band of well-meaning conspirators intend to avert a devastating world war by uniting humanity in hatred of a fictitious Lunar enemy only to find that the moon is truly inhabited and that they had unwittingly set off the first interplanetary war. This, too, is explicitly described as an excerpt from a future history book. 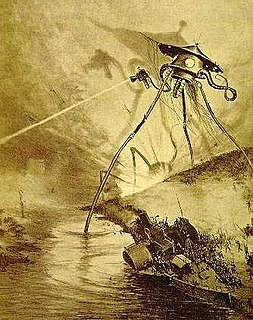 The most ambitious of this subgenre is H. G. Wells' The Shape of Things to Come (1933), written in the form of a history book published in the year 2106 and—in the manner of a real history book—containing numerous footnotes and references to the works of (mostly fictitious) prominent historians of the 20th and 21st centuries. John Griffith London was an American novelist, journalist, and social activist. A pioneer in the world of commercial magazine fiction, he was one of the first writers to become a worldwide celebrity and earn a large fortune from writing. He was also an innovator in the genre that would later become known as science fiction. Stephen Baxter is an English hard science fiction author. He has degrees in mathematics and engineering. The Xeelee Sequence is a series of hard science fiction space opera novels, novellas, and short stories written by British science fiction author Stephen Baxter. The series spans billions of years of fictional history, centering on humanity's future expansion into the universe, its cosmos-spanning war with an enigmatic and supremely powerful Kardashev Type IV alien civilization called the Xeelee, and the Xeelee's own war with dark matter entities called Photino Birds. The series features many other species and civilizations that play a prominent role, including the Squeem, the Qax, and the Silver Ghosts. Several stories in the Sequence also deal with humans and posthumans living in extreme conditions, such as at the heart of a neutron star (Flux), in a separate universe with considerably stronger gravity (Raft), and within eusocial hive societies (Coalescent). 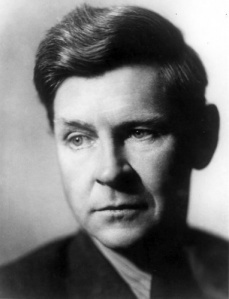 William Olaf Stapledon – known as Olaf Stapledon – was a British philosopher and author of science fiction. In 2014, he was inducted into the Science Fiction and Fantasy Hall of Fame. Unlike alternate history, where alternative outcomes are ascribed to past events, future history postulates certain outcomes to events in the writer's present and future. Alternate history or alternative history (AH) is a genre of speculative fiction consisting of stories in which one or more historical events occur differently. These stories usually contain "what if" scenarios at crucial points in history and present outcomes other than those in the historical record. The stories are conjectural but are sometimes based on fact. Alternate history has been seen as a subgenre of literary fiction, science fiction, or historical fiction; alternate history works may use tropes from any or all of these genres. Another term occasionally used for the genre is "allohistory". The essential difference is that the writer of alternate history is in possession of knowledge of the actual outcome of a certain event, and that knowledge influences also the description of the event's alternate outcome. The writer of future history does not have such knowledge, such works being based on speculations and predictions current at the time of writing—which often turn out to be wildly inaccurate. For example, in 1933 H. G. Wells postulated in The Shape of Things to Come a Second World War in which Nazi Germany and Poland are evenly matched militarily, fighting an indecisive war over ten years; and Poul Anderson's early 1950s Psychotechnic League depicted a world undergoing a devastating nuclear war in 1958, yet by the early 21st century managing not only to rebuild the ruins on Earth but also engage in extensive space colonization of the Moon and several planets. A writer possessing knowledge of the actual swift collapse of Poland in World War II and the enormous actual costs of far less ambitious space programs in a far less devastated world would have been unlikely to postulate such outcomes. 2001: A Space Odyssey was set in the future and featured developments in space travel and habitation which have not occurred on the timescale postulated. A problem with future history science fiction is that it will date and be overtaken by real historical events, for instance H. Beam Piper's future history, which included a nuclear war in 1973, and much of the future history of Star Trek . Jerry Pournelle's "CoDominium" future history assumed that the Cold War would end with the United States and Soviet Union establishing a co-rule of the world, the CoDominium of the title, which would last into the 22nd Century—rather than the Soviet Union collapsing in 1991. There are several ways this is dealt with. One solution to the problem is when some authors set their stories in an indefinite future, often in a society where the current calendar has been disrupted due to a societal collapse or undergone some form of distortion due to the impact of technology. Related to the first, some stories are set in the very remote future and only deal with the author's contemporary history in a sketchy fashion, if at all (e.g. the original Foundation Trilogy by Asimov). Another related case is where stories are set in the near future, but with an explicitly allohistorical past, as in Ken MacLeod's Engines of Light series. In other cases, such as the Star Trek universe, the merging of the fictional history and the known history is done through extensive use of retroactive continuity. In yet other cases, such as the Doctor Who television series and the fiction based on it, much use is made of secret history, in which the events that take place are largely secret and not known to the general public. As with Heinlein, some authors simply write a detailed future history and accept the fact that events will overtake it, making the sequence into a de facto alternate history. Lastly, some writers formally transform their future histories into alternate history, once they had been overtaken by events. For example, Poul Anderson started The Psychotechnic League history in the early 1950s, assuming a nuclear war in 1958—then a future date. When it was republished in the 1980s, a new foreword was added explaining how that history's timeline diverged from ours and led to war. Orphans of the Sky is a science fiction novel by American writer Robert A. Heinlein, consisting of two parts: "Universe" and its sequel, "Common Sense". The two novellas were first published together in book form in 1963. "Universe" was also published separately in 1951 as a 10¢ Dell paperback. These works contain one of the earliest fictional depictions of a generation ship. A fictional universe is a self-consistent setting with events, and often other elements, that differ from the real world. It may also be called an imagined, constructed or fictional realm. Fictional universes may appear in novels, comics, films, television shows, video games, and other creative works. An alternative universe is the occurrence of canonical facts about the setting or characterization of a particular fictional universe being explored in a non-canonical way. These universes are often made unofficially, though elements of fan fiction are sometimes used in official, though usually non-canonical, storylines. The Big Time (1958) is a short science fiction novel by American writer Fritz Leiber. Awarded the Hugo Award during 1958, The Big Time was published originally in two parts in Galaxy Magazine's March and April 1958 issues, illustrated by Virgil Finlay. It was subsequently reprinted in book form several times. The Big Time is a story involving only a few characters, but with a vast, cosmic back story. Farewell Fantastic Venus is a science fiction anthology edited by Brian Aldiss and Harry Harrison. It was first published in 1968 as a direct response to the information returned from the first space probes sent to Venus, especially the first atmospheric probe to return data, Venera 4. The first data was not returned from the surface until Venera 7 successfully landed in 1970. The Shape of Things to Come is a work of science fiction by H. G. Wells, published in 1933, which speculates on future events from 1933 until the year 2106. Question and Answer is a science fiction novel by American writer Poul Anderson. It originally appeared in the June and July 1954 issues of magazine Astounding Science Fiction, and was later reprinted in 1956 as part of Ace Double D-199 under the title Planet of No Return, and again as a stand-alone Ace novel in February 1978 under the original title. The Psychotechnic League is a future history created by American science fiction writer Poul Anderson. The name "Psychotechnic League" was coined by Sandra Miesel in the early 1980s, to capitalize on Anderson's better-known Polesotechnic League future history. Anderson published 21 novels, novellas and short stories set in this future between 1949 and 1957, with a 22nd published in 1968. '"Marius" is a science fiction short story by American writer Poul Anderson, first published in the March 1957 issue of Astounding Science Fiction and reprinted in the collections The Horn of Time (1968) and The Psychotechnic League (1981). As a component of the Psychotechnic League future history / alternate history, "Marius" takes place in 1964, six years after the initial nuclear exchanges of World War III. Although it is chronologically the first story in the Psychotechnic League sequence, "Marius" was one of the last to be written. It serves as a prequel to the earlier novella "Un-Man", introducing the character of Étienne Fourre. In the Courts of the Crimson Kings is a 2008 alternate history science fiction novel by American writer S. M. Stirling. "The Sensitive Man" is a science fiction novella by American writer Poul Anderson, first published in the January 1954 issue of Fantastic Universe and reprinted in the 1981 collection The Psychotechnic League. The story is a component of the Psychotechnic League future history, and takes place in the year 2009, between "Un-Man" and "The Big Rain".